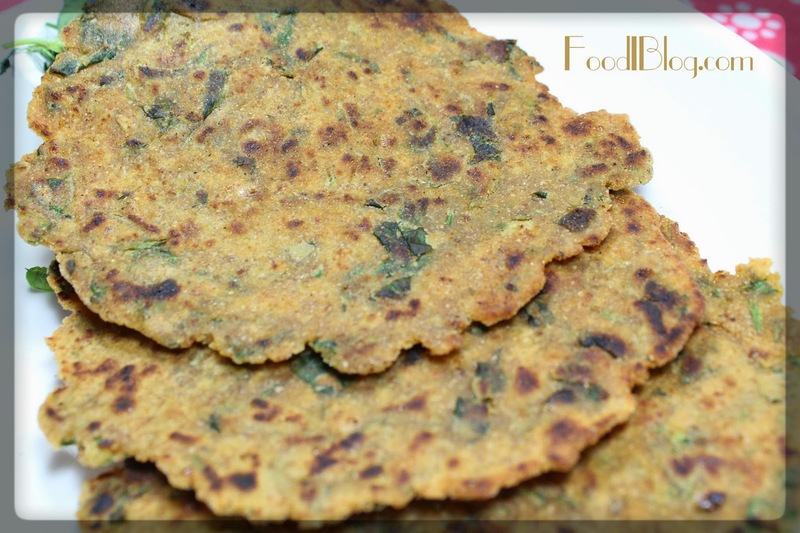 In this recipe of dhebra, millet flours combines with fenugreek leaves and yogurt to yield an unusually soft, savory bread that is accented by spices, chillies and garlic. Paired with Curd or Sweet chutney or any Raita, this nutritious, flavorful Indian bread may be served as either a light one-dish meal or an afternoon snack. 1. Combine all the ingredients along with 3 tsp of oil in a deep bowl to make a soft dough, using enough water. 2. Divide the dough into 6-8 equal portions. Pat a portion of the dough into a 50 mm. (2") diameter and 1 cm thick circle in between your palms. 3. Place it on a hot tava (griddle). Pat and place 4 more such dhebras on the tava (griddle) at a time. 4. Cook these 5 dhebras on a medium flame using 1/2 tsp of oil, till they turn golden brown in colour from both the sides. 5. Repeat the steps 3 and 4 to get 6-8 more dhebras in more batches. 6. Serve hot with fresh curds. I made them as breakfast today morning for my husband and it was very delicious.